Technik are proud to be the sole authorised UK and Ireland sales and support centre for the innovative Promess range of products. Technik engineers have been using Promess systems for over 20 years. Technik can also assist with the PLC integration of the Promess. Call Technik now for helpful advice and support. We have a team of experienced engineers on hand to carry out essencial maintainance and servicing. We recommend servicing be carried out every 12 months or every 5000 working hours whichever is first (For presision presses we reccomend servicing be carried out every 1000 working hours). This will ensure your press will continue to operate as is should. Our servicing includes an inicial safety check and visual inspection, extensive check of all mechanical parts, lubrication of all necessary parts and a full software backup. 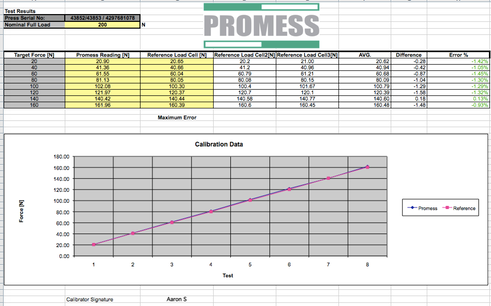 All services include a 8 point calibration as standard, you will recieve a signed calibration certifice as well as a software backup of all your parameters and press programs.